Welcome to the Australian state of Victoria, where the minister of health, Jill Hennessy, has just put all doctors under the gun. He could have his license to practice stripped. He could be prosecuted. He could be denied a way to earn a living. Instead, in order to allow a child an exemption from taking vaccines, evidence must be shown from some sort of medical registry. How this system will work is not clear. What is clear: In violation of privacy, all children’s medical records and history will be recorded and made available to health/government authorities, who will then see whether there is a prior incident where a child has reacted badly to a vaccine, whether the child has an allergy to vaccine ingredients (such as chicken eggs), whether there is a history of adverse vaccine reactions in the child’s family. The government, not the child’s doctor, will decide whether vaccination can be skipped or must take place. And because the State is firmly and irretrievably pro-vaccine, despite evidence showing vaccines are ineffective and dangerous, you can see how this plan will work out. Like sheep, children will be led into the pen where the needles are waiting. 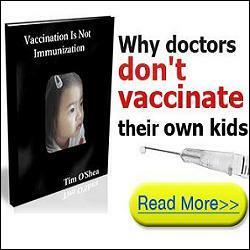 Doctors who stand up and say no to vaccination, for any reason, will be excommunicated. So it is now time for doctors, singly, and in groups, to stand up and speak up. Their silence is collaboration. The Crazz Files, one of the great Australian websites exposing vaccines, is now running a piece about Meryl Dorey, a brave and brilliant woman who is the head of AVN, “Australia’s national vaccine-safety consumer health lobby group…[Dorey] has called upon Jill Hennessy, Victoria’s Health Minister, to demonstrate that, “There are no risks in vaccinating your children”. I agree completely. Let Minister of Health Hennessy prove her point that all vaccines are safe and effective. Starting now. No more beating around the bush making claims. Take all the vaccines you claim are wonderful for children. I say Hennessy knows nothing about vaccines. She’s a parrot, repeating what “experts” say based on what other “experts” say. That’s all. And you doctors in Australia: why can’t you support this simple plan and demand Hennessy do what she wants children to do? Or do you think it’s laughable and trivial that you once took an oath to do no harm? Australia is a prime battleground. The country is rapidly devolving into a medical police state. At the same time, more people are speaking out against compulsory vaccines. The time to tell and expose the truth is now. By the way, Jill Hennessy should ask any “expert” to provide her with a well-done study proving that taking vaccines in combination, all at once, is safe. I’m talking about a long-term double-blind study, with two large groups, tracking all participants for several years. If she asks, she’ll be surprised. Such a study doesn’t exist. But the medical establishment insists it knows this practice is perfectly safe. That’s called fake scientific news. NextU.S. Tobacco Must Issue “Corrective Statements” – When Will The Courts Demand The Same For Vaccine Makers “Tobacco Science”?